Cured Sheep Cheese in olive oil matured for at least 90 days. Natural bark, smeared with olive oil and dark yellow in colour, featuring the typical engraving originated by the old esparto grass disputes. Its body is compact, cream-coloured, where the presence of small mechanical eyes can be noticed. 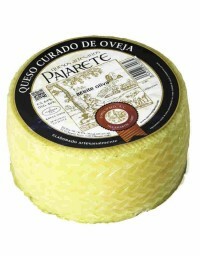 Hard cheese with a firm texture and slightly brittle when cut, but soft on the palate. Clean and elegant taste. Mild aroma of sheep's milk and nuts, with sweet touches in the aftertaste. Medium persistence.